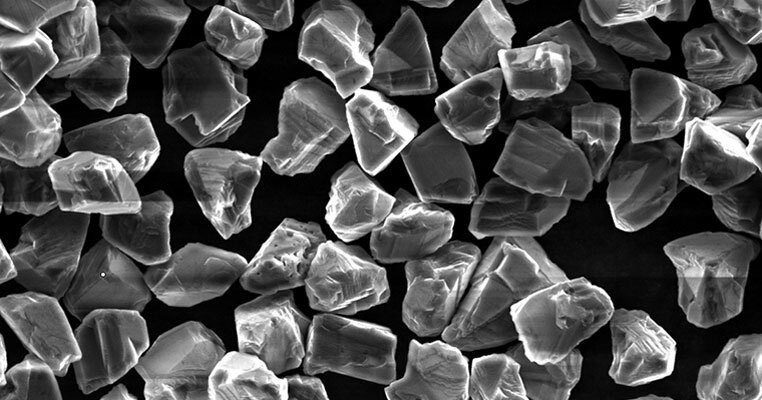 An example of blocky crystals with etched surfaces. Advanced Abrasives Corporation offers a premium line of superabrasive products customized for high pressure/high temperature sintering applications for PCD and PcBN (polycrystalline diamond and polycrystalline cubic boron nitride). During high pressure sintering, a percentage of material fractures and reveals new surfaces that were previously intrinsic to the crystal. If the material has high internal impurities they will reveal themselves at the surface as the crystals fracture. These impurities may result in inefficient sintering/bonding due to contaminant migration into the catalytic/solvent system and/or between the diamond-to-diamond interface. A low level of intrinsic impurities is essential in optimizing the sintering process. Advanced Abrasives selects premium feedstock crystal with the lowest level of intrinsic impurities currently available. Proprietary milling techniques are used to size reduce and to shape the material ensuring consistent morphology with each and every batch of material. Additionally, our cleaning process incorporates a proprietary chemical/mechanical cleansing technique. This enables us to reduce or eliminate unwanted organics/elements and control the topography of the crystal. Surface characteristics can range from smooth to completely etched depending on customer requirements. For the sizing of our superabrasive product, we use many different classification techniques. Each technique is monitored and controlled with strict statistical process control guidelines. We custom grade all products for sintering applications based on each customers' unique abrasion/impact requirements and we can provide compounded / stratified blends. Each step of the grading process is controlled and monitored. Advanced Abrasives Corporation uses 100% lot inspection to ensure consistency from batch to batch. Final inspection consists of many measures to ensure the highest quality products possible. 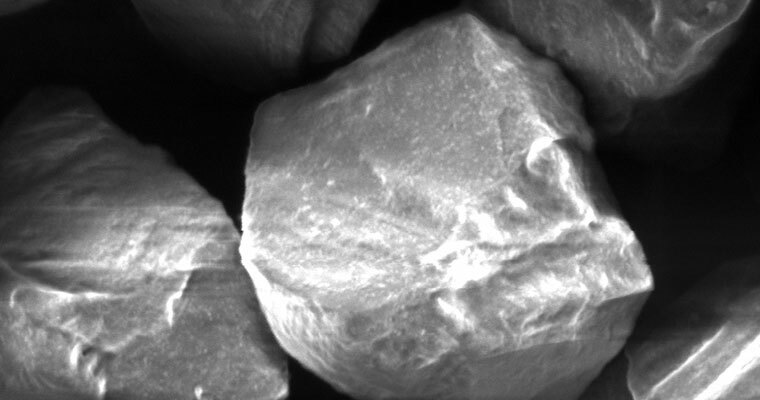 We monitor particle size distribution (PSD) using the Horiba LA 910, Microtrac X-100, Coulter Multisizer III, CPS Differential Sedimentation, SEM/TEM or optical light microscope. After PSD analysis, the material goes through an extensive ion reduction process and a surface purification process. The final product is certified using Ion Chromatography, Inductively Coupled Plasma and DC Arc instruments. Typical levels of the most critical ions/elements that can hinder the sintering process are held below 1ppm*. An example of finished PCD Feedstock. *If lower detection limits are needed, Neutron Activation Analysis can detect elements in the ppb range.